Maintaining soil health is fundamental to successful crop production and ecosystem sustainability. To enable effective management soil health must first be measured and then monitored and so the authors review and evaluate how soil organisms can be used to fulfil this role. 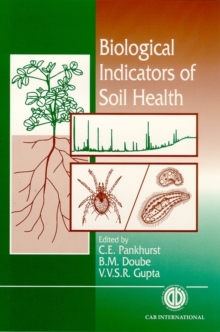 This book is essential for all soil scientists and consultants. It is of particular relevance to those involved in soil health monitoring and maintenance as well as those undertaking soil remediation. It is also important reading for agronomists, ecologists and environmentalists. This book is a comprehensive and effective resource for all those working to sustain healthy soils.